Recently, I’ve been re-evaluating my career choices, and I’ve come to realize that I’ve been pretending to like something that I really don’t like. So, I’ve been mentally trying different jobs on. And wonder, would this job fit? Would it be too snug, like an uncomfortable pair of shoes? Or would it be too comfortable, like my favorite yoga pants? A career, job, whatever it is you have to do to earn money, should be something that’s challenging, but not too challenging. Slightly structured but not too structured. It should be juuuussst right…maybe that makes me a career Goldilocks. But, this mentally trying on of careers has raised the question , am I pretending in other areas of my life? I pretend that I enjoy being with certain people, when really I just want to punch them in the face, doing so with all the love of Jesus in my heart. Instead I smile politely and tolerate their presence. (Don’t worry, these people know who they are. My polite smile is pretty obviously a fake one.) I pretend to enjoy certain activities, when all I want to do is sit on the couch with my Oero’s and binge watch something on Netflix. I pretend to enjoy subject matter to try to better my career, but all it does is make me want to take a nap. Some of this pretending is to be polite, but some of it, I wonder if it’s me lying to myself. Either way you cut it, the pretending is getting to be a bit much, and makes me wonder if my entire life is one big game of pretend. When I was a kid, my favorite game to play was “House”. You were all kids once, I’m sure your familiar…it’s a game of pretend, you make a pretend life, with a pretend house, a pretend job, pretend kids, it’s all pretend. Sometimes, this game was acted out with Barbie and Ken, sometimes, if there were enough friends around we’d play the roles ourselves. In my games of house, I was always an educated career woman, who had both a fulfilling career that she loved, and a loving family to come home to. She had a big yellow house with a wrap around porch, went to Disneyland whenever she wanted, and had a rockin’ pink corvette (just like Barbie). She also had big curly hair treated hourly with Aquanet and always wore puffy sleeves, it was the 80’s after all. It was fun, it helped me shape what I wanted my future to be. But it was fun, pretend, but fun. Real life, is nothing like the pretend game I had envisioned in my 8 year old head. Real life doesn’t have weekly visits to Disneyland, a pink corvette, definitely no big curly hair treated hourly with Aquanet, and for me no yellow house with a wrap around porch. Real life, although full of many many blessings, also holds uncertainty, self doubt, anger, jealousy, and pretending, but not the good kind. So, with all of this worry about pretending, I do what any Christian does in this situation. I pray about it, I take it to the Lord. And he assures me, that I can’t pretend around Him. He knows what’s in my heart, and He knows where the “just right” place for me is in this world. He also tells me, that this world is not my home, so everything will feel like those uncomfortable but cute pair of red heels, wearable but still a little snug. My home is where He is, my home is in Heaven, where He has prepared an awesome mansion for me. I can stop pretending, I can be myself. That’s where faith comes in, switching it up a little, letting your heart lead, and making your head follow that lead. And that’s where the pretending can finally stop. When you follow your heart there’s no way you can pretend, because your heart and your calling never lie. See, your calling is from God and God never lies. We lie to ourselves, we lie to each other, we have perfected lying, but God…He’s the only one that will be honest. The only one you don’t have to pretend around. So, kick off those uncomfortable but cute red heels, maybe pull out the orero’s, relax, listen to your heart, and stop pretending! P.S. 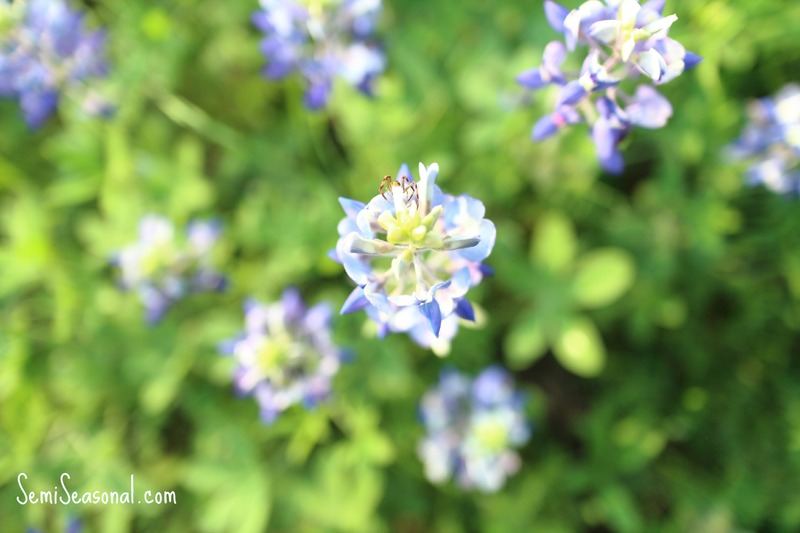 If you like Bluebonnets and various other wildflowers. I will be posting about my tour de Tejas in a few days. There will be flower photos a plenty!